To configure a language use transaction I18N -> 'I18N Customizing' -> 'I18N System Configuration' and follow the online documentation. To add a language key which has not been supported on non-Unicode(The Unicode standard covers all characters and languages that have been standardized for processing with computers) systems press button "Extend Language List" (the input help gives you the list of available languages). Execute and go back to the main screen. Your selected language is now available in the F4 Help of the key field. Afterwards you have to manually update the DEFAULT profile parameter zcsa/installed_languages to include all of the active languages (use the internal 1-letter language keys, such as "E" for English, "D" for German, or "1" for Chinese. Case sensitive!). You can copy the new value from the Simulation/Activation results screen and paste it into the field in transaction RZ10, for example. You need to restart the system after the profile parameter modification. Please note that the internal representations of some languages are Korean characters; you will see such values e.g. in table T002. These characters are used internally only, the user interface shows 2-letter language keys (upper case). They correspond in most cases to the ISO 639-2 alpha-2 language code (lower case). Example: The ISO639-2 alpha-2 code for Vietnamese is "vi", SAP's corresponding two letter language key is "VI". The mapping between the internal 1-letter language keys and the external 2-letter representation is defined in table T002. If you see a (Korean) 1-letter language key, for example in a trace file, you can look up the 2-letter representation and the name of the language from table T002. Use transaction SE16 and paste the 1-letter key into the input field for 'SPRAS'. The input field has space for two characters, but accepts also the 1-letter key. When you press 'Return', the 2-letter representation occurs in the input field. When you press 'Execute (F8)', the corresponding line of table T002 is displayed, including the name of the language in field 'SPTXT'. A new language is supported in a SAP System if it is supported in Microsoft products (Regional options in the Windows operating system, input methods, fonts, use in office products like MS Word). The following limitations apply to the languages which are supported only in Unicode systems. Smartforms are supported. The graphical PC-Editor for Smartforms is not supported. For printing Smartforms, see section 'Device types' below. The print preview for Smartforms may be incorrect if complex rendering is required. SAPscript is not supported. Use Smartforms instead. For printing ABAP lists, see section 'Device types' below. Supported device types for printing are:SWINCF . This is the recommended device type for new languages. LEXUTF8 and HPUTF8 are able to display most Unicode characters, but have no complex rendering capabilities. For PDF conversion, you can us the device type PDFUC . Texts which require complex rendering may not be correctly displayed or printed when using Adobe Interactive Forms. Refer to the documentation by Adobe or try it out. The Graphical Screen Painter does not support Unicode. Please choose the Dynpro version instead. Network and chart graphics can display the texts only if they are covered by the current font character set of the SAPGUI. The length of text that can be displayed in certain controls is limited (Toolbar). All characters that are supported by the browser can be displayed. During an upgrade the configuration of Unicode-only languages can get lost, because the modified table T002 is replaced during the upgrade phase. After the upgrade the language configuration as described above (section "Activating a new lnguage key") needs to be reapplied. During conversion into non-Unicode code pages and in communication with non-Unicode RFC partners characters from scripts that are supported only in Unicode systems are replaced by a replacement character (#). The sorting may be not identical to the sort order that is typically used for this language. In most cases the Unicode standard sort algorithm is used. Language specific date, time, and number formatting in Java applications is not supported. The '_' placeholder in a LIKE pattern in database search matches one code unit. In some cases (supplementary character, combining character) this is not identical to what the user refers as one character (especially in Thai, Vietnamese, Indic languages, Hong Kong Chinese). Prefer to use '%' placeholder in language dependent data. Transliteration into Latin alphabet for bank forms (Function module SCP_REPLACE_STRANGE_CHARS) is not supported. 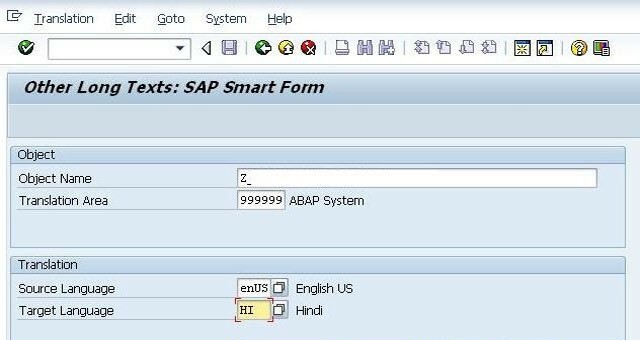 Read Here at SAP ABAP Interview Questions to Get Questions and Answers with Explanations Related to Printing Smartforms.